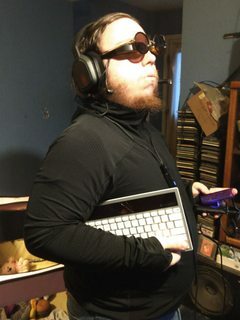 My Cyberdeck project: a wearable computer for the dark future ahead. Greetings, I am zalost, I'm a tech enthusiast and pro transhumanism. 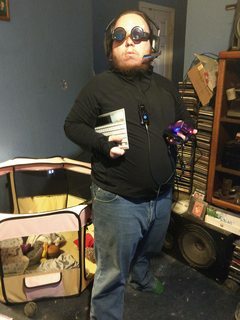 I'm also a HUGE fan of cyberpunk and as such I've always been inspired by the idea of a screenless computer which interacts with us in a natural way. because of this I've been working on a project for a long time now with tons of research and time spent trying to get a working prototype, I had one working a couple years ago but it wasn't ideal, mostly because I had to carry around a satchel to use it due to it's mass. while 2.0 is still in the planning stages however I decided to bring Cyberdeck V1 off the shelf and do some upgrades to it. 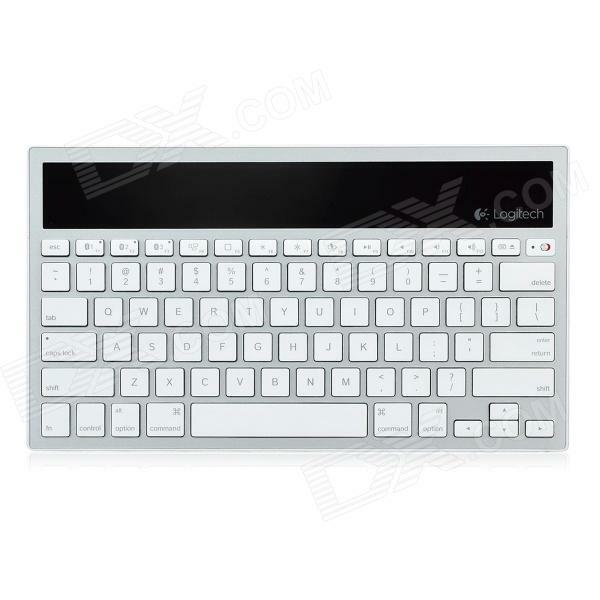 1 Logitech Solar powered Multi-device bluetooth keyboard. 1 Raspberry pi Model 3 in a protective shell. and finally, a very light weight version of debian running in text mode (works great for low rez applications like this, and setup right this is insanely useful. there some big reasons I went with a raspberry pi, part of it is because of the flexibility of the platform (you can literally make it do just about anything), and part of it is because of it's low power requirements. but the biggest part, and the thing that makes this whole deal the closest I've found to a real cyberpunk computer? the GPIO, you can literally program those pins to interface with ANYTHING, elevator buttons, microwaves, Satellite uplinks... anything. so if done right someone using a wearable like this could go up to a network junction box outside, rig up the right GPIO pins with alligator clips, splice into the hard line, and interface with the network directly, all while wearing a computer that fits in their pocket thus allowing optimal stealth. if that doesn't sound like something out of a cyberpunk novel... I have no idea what does... at least until we get brain jacks and neural interfaces, this is probably the closest we'll get. so what are your thoughts, anyone ever tried something like this before? I'll post some pictures of it in action later. here's a few pictures of the setup, I haven't gotten the attachment points setup yet but the hardware works. in one hand, the battery and CPU, in the other, the keyboard for interfacing. I'm thinking velcro for attaching it to stuff, but that's for next weekend when I have more time to work on it, I've work tomorrow lol. as for the screen, well it's nothing special, right now it's command line only but I'm working on a gui for it... eventually I'd also like to bring a camera into the mix so I can overlay the CLI overtop the real world for augmented reality, then combine that with a GPS for navigational stuff. just some ideas I'm working on. Awesome!! Have you seen that recent movie with Johnny Depp? Where his consciousness is transferred to a computer upon his death? It's really good!!! so I've been doing some research and one Idea I've had for a while was to overlay the Command interface with some kind of camera feed. so I'm curious, Infra red, regular, or thermal? and the raspberry pi foundation offers both a regular and an IR option. That's, pretty cool actually. Given time it can be more compact I'm sure. So update, turns out there's a camera multiplexer, and with the right removable filter I only need the ir and thermal cameras, reducing it to two. And I'm going to be integrating it all into a pair of goggles rather than the glasses to support it all better 😁. I'm currently trying to get the parts together.